Due to player availability, I ended up starting a three-player game of Ryuutama instead of continuing our Apocalypse World game. The party's Diary Keeper has posted an account of the journey, so I'm going to focus more on how I prepped and ran the game. Ryuutama normally relies on the GM to plan out the journey over about three days, including the weather and encounters. Day 1 will be Rainy Grassland, Day 2 will be Cloudy Hills and an encounter with five Mob Beasts, and so on. This allows the difficulty of the journey to be tailored to the capability of the party. 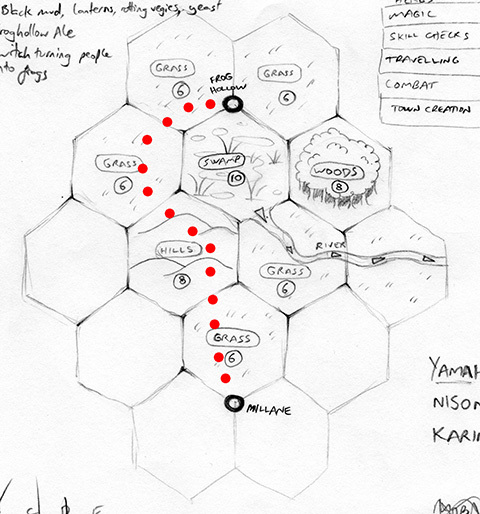 However, I like the idea of giving players a choice over their route, so I made up a simple hex map. 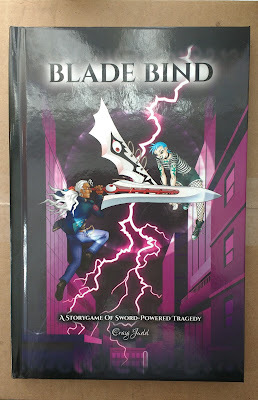 Unlike my solo game though, it was designed with a Level 1 party in mind rather than being entirely randomly generated. To get from their starting town of Millane to their destination of Frog Hollow, they'd mostly have to pass over Grassland. I put in an area of Hills and Woods, but the main feature was a Swamp. The group would have the choice of a three-day journey if they went through the Swamp, or a four-day journey to go around it. Also in the spirit of hexcrawl, I noted down the weather forecast for a few days. Regardless of where they are each day, there will be specific weather in effect for that day. I started out with Rain, then Cloudy, then Fog, then any additional days would be Clear. I set it up this way so on the second day, if they kept to the Grasslands, they'd have to ford a swollen stream. If they took to the more difficult Hills it would be drier. Lastly, I made up a simple random encounter table. Each day there's a 1 in 4 chance of an encounter. Since I wasn't sure how much of a challenge I could throw at the party, I picked one Level 1 or 2 monster for each type of terrain, along with a random number encountered. Making character is pretty quick and easy, but equipping them takes somewhat longer! I prefer to go with the full equipment options rather than the simplified "Picnic" rules, so everyone spent a while shopping for gear and supplies. James plays Karin, a Healer/Technical character on a family pilgrimage to Frog Hollow. Her personal item is a pink scarf given to her by her mother before she set off. +Michael plays Yamahaki, a Minstrel/Attack character. His personal item is a silver flute that he can't play, a gift from his father. +Sasha plays Nisonoya, a Hunter/Technical character who wants to see Frog Hollow's zoo to catalogue many different creatures. His personal item is a necklace. I made them take one bad attribute on their free starting weapon, so Karin has a gross great-axe (covered in gore), Yamahaki an uncool crossbow (with fluffy dice), and Nisonoya a gross wakiszashi (the handle is covered in sticky goo from a slime monster). Karin managed to buy a suit of gross uncool smelly light armour, although I forgot to ask what that was like. Nisonoya ended up with a pair of smelly climbing shoes. Apart from that, they managed to buy most things without having to take any negative tags to reduce the cost. They even pitched in to buy the Party Kit, including a pack animal (chocobo). I meant to make up a Ryuujin, but was so busy assisting with character creation that I forgot! It's definitely a Green Ryuujin, but is obviously following the characters at a safe distance this time around. I don't think the Ryuujin can do much to affect the first journey anyway, unless it spends Life Points, since they usually don't gain slots to put powers in until Level 2. I established a few details about their destination - the village of Frog Hollow (pop. 300) was founded where a swamp meets grasslands. I then wrote down the other town questions on scraps of paper and each of the players chose one to fill in. I then fleshed out the remaining answers. The players decided that Frog Hollow featured a zoo, a church, and a brewery. The local specialty is Froghollow Ale, made with a secret ingredient. The town is threatened by a witch in the swamp who's been turning people into frogs. I concluded that it was an Aristocracy, ruled by a small local noble family. The town is permeated by the dark bluish-black of swamp mud, but highlighted by the friendly golden glow of lanterns. The funky smell of yeast and rotting vegetables lies over the village like a blanket. The characters are all inhabitants of Millane, a town with cobbled streets, windmills, and white plastered houses with terracotta roofs, surrounded by lush farms, fields, and boundless grasslands. For various reasons, they have come together to travel to the village of Frog Hollow which is about four days away. Shortly after they set off, it began to rain. Yamahaki had a fairly low Condition roll for the day, but as I experienced with my solo game Condition didn't really become a factor throughout the journey. They succeeded on all their Travel rolls (some only just), and even tracked and defeated a poor solitary Mob Beast. Since the plains were still sodden from the rain yesterday, the group decided to head up into the hills. They found their way okay, although Karin got a bit worn out from travelling. Although they avoided the flooded river on the grasslands, I put a landslide hazard in their path. Luckily they spotted signs that the hillside was unstable, and hung back just as the earth gave way and slid across the path! Using rope and climbing gear, they managed to cross over the landslide and continue safely on their way. From the hillside, the group could see out across the swamp. Frog Hollow lay on the other side; they could get there by evening if they went straight through the swamp, but they opted to take the longer route around through the grassland. Nisonoya had been catching small game as they travelled, so they were in no danger of running out of food. The grassland was swathed in fog, but even so Nisonoya found the tracks of a Mob Beast pack. They opted to track them down, and defeated them all. Karin sustained a minor injury, and also rolled the only Fumble of the journey while attacking with her great-axe. Nisonoya managed to harvest the Mob Beasts' fangs. I made him roll once for the group rather than once per beast, and as he rolled exceptionally well I granted him one High-Quality Fang as well. As we were running low on session time, we skimmed over Day 4. Movement and Direction checks were both made, but I didn't check for an encounter. They arrived safely at Frog Hollow as the sun was setting. We didn't have time to do any roleplaying at their destination, or do much end of session bookwork. Everybody gained 210 XP for the journey, so they'll level up before we start the next session. I found it to be an enjoyable game, lighthearted and with laughs and cheers around the table. It made a stark contrast to our recent tense first session of Apocalypse World the week before! I would like to see Condition come into play, so I may need to plan some more difficult journeys and do a bit more reading up on monsters so I can offer a bit more of a challenge. I have a feeling that the next session might involve dealing with the swamp witch, but although it's difficult terrain it's really only a day-trip. If I throw in some complicating factors, though, it might form a decent adventure. Before the next session, I'll also write up my Ryuujin properly. Since I've overseen one journey, it'll go to Level 2 and actually get some slots for powers.